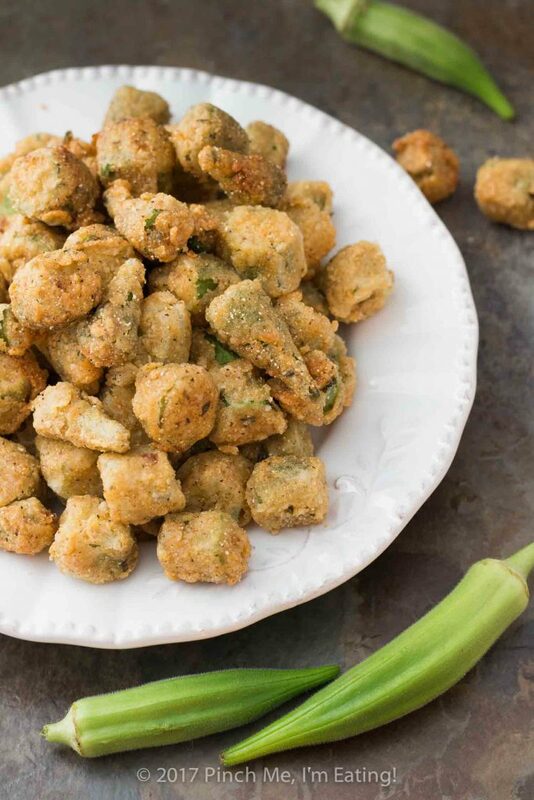 Classic Southern Fried Okra with Cornmeal | Pinch me, I'm eating! 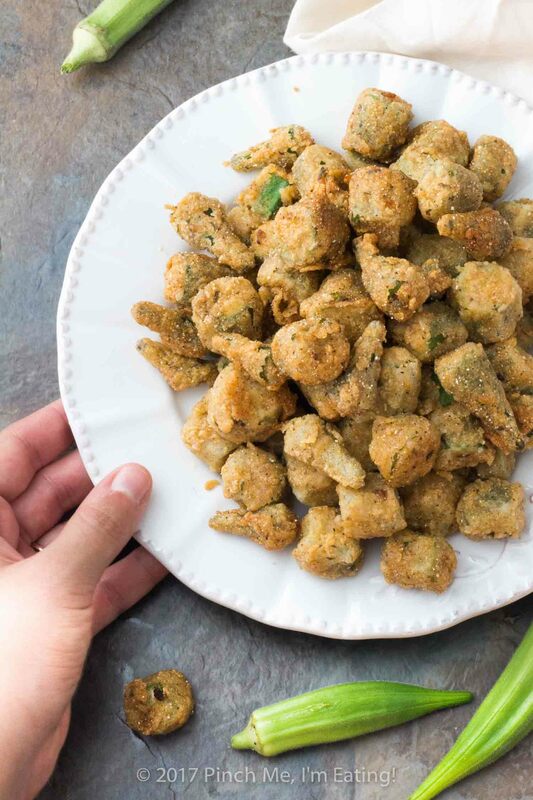 Classic Southern fried okra with cornmeal is tender-crisp on the inside and crispy on the outside — perfect for okra lovers and okra skeptics alike! Okra seems to be the one thing (besides basil) that I can grow well in my garden. 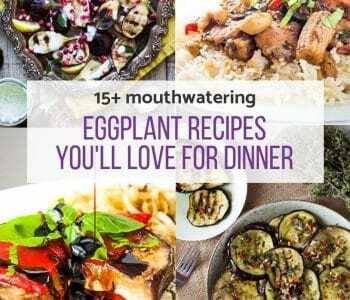 It’s a good thing, too, because it’s one of my favorite vegetables! This year I planted twice as many as last year, from seed, and my dozen or so plants are finally starting to produce pods! If you’re a devoted okra lover like myself, you could make this refrigerator pickled okra. And this three meat and okra gumbo is one of my favorite things to make and eat off of for a week! 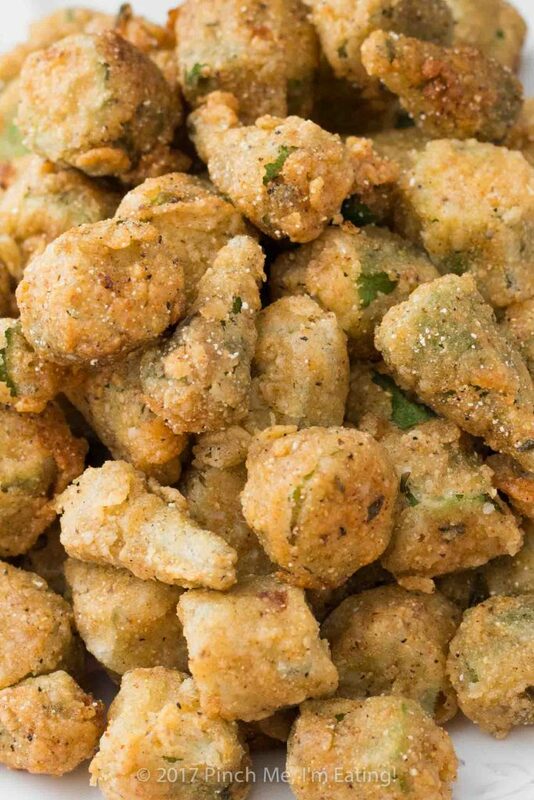 But even people who don’t love okra seem to have an exception when it comes to fried okra. What’s not to like? 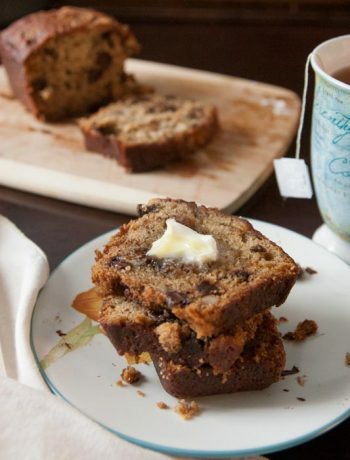 Any of that infamous slime the okra may have had just becomes part of the batter. And when it’s done right the okra is tender-crisp on the inside and perfectly crispy on the outside with a light, flaky flavorful cornmeal breading. 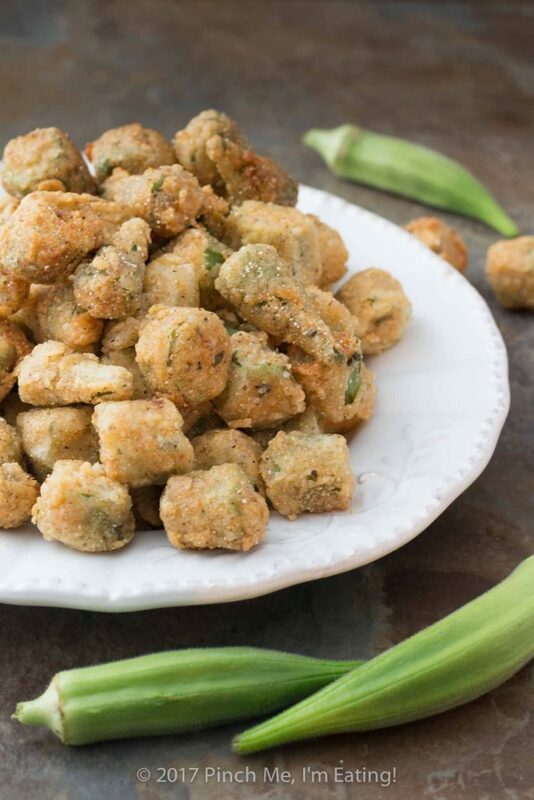 If you’re trying out okra for the first time, are an okra skeptic, or if you’re trying to get your okra-hating friends to change their minds, classic Southern fried okra with cornmeal is a great gateway dish to the wonderful world of okra. 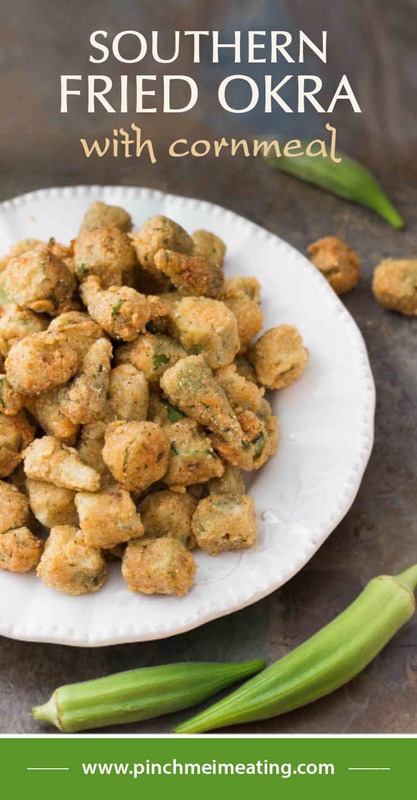 This Southern fried okra is first soaked with buttermilk, and then dredged in a mixture of flour, cornmeal, and a whole heap of spices. Finally, it’s shallow-fried in about a half inch of oil in a cast iron skillet. 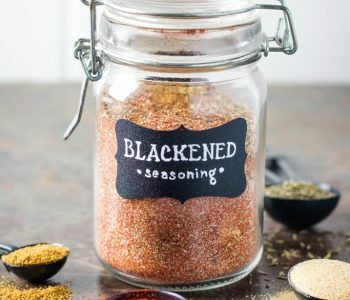 You can definitely simplify the seasonings and just do a simple salt-and-pepper blend, but I do love it when it’s full of flavor and seasoned like I like my fried chicken! I don’t often fry things in oil because it’s kind of a pain to clean up and it makes my house smell like oil for a day or two. But if there’s ever a reason to pony up and do it, this Southern fried okra with cornmeal is a pretty good one! 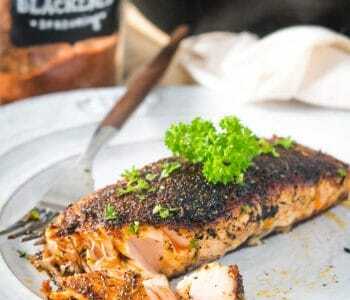 If you strain your used oil through a coffee filter (or paper towel, since I don’t actually own coffee filters) you can reuse it at least a couple times for frying other savory foods. 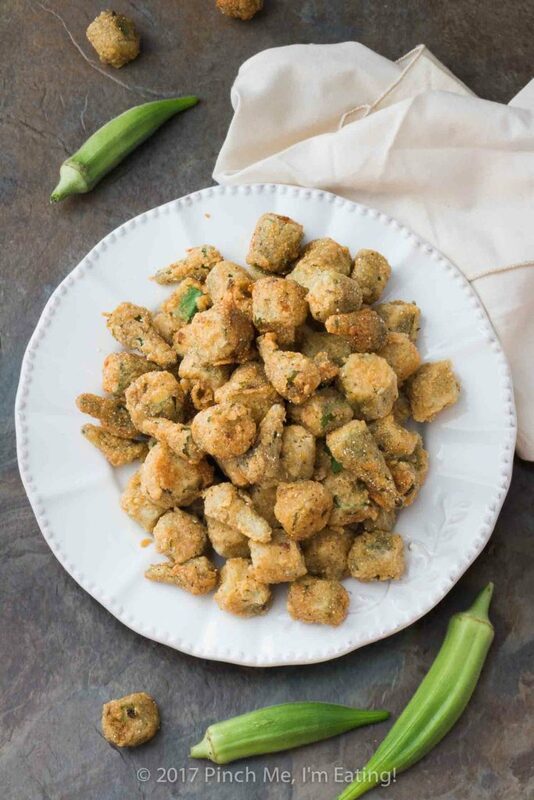 While I like okra just about any way you prepare it, fried okra is a classic and always a treat! 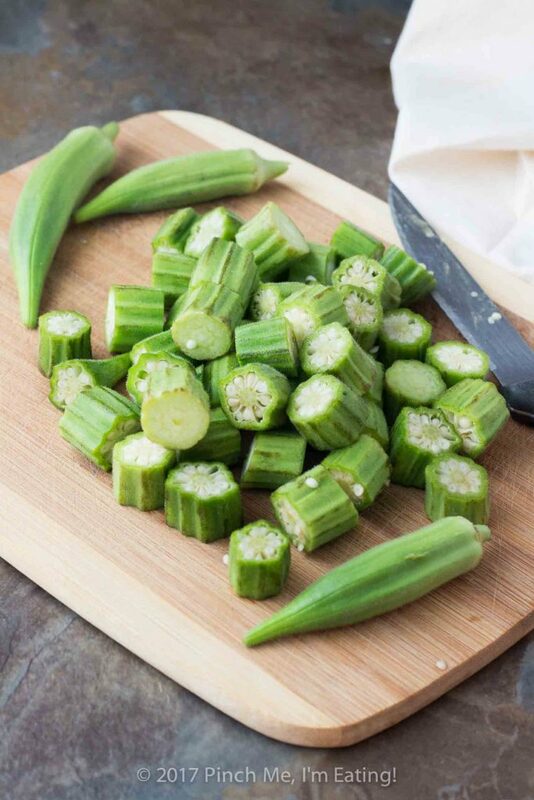 Wash the okra and trim off stems. 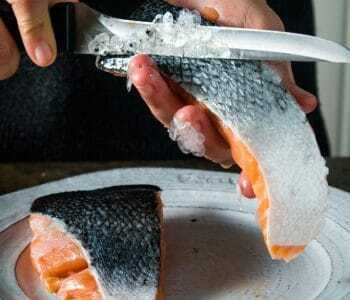 Cut into 1/2-inch slices. Pour buttermilk into a large, flat-bottomed bowl and toss the okra in it until fully coated. In another large flat bowl, combine flour, cornmeal, garlic, onion powder, paprika, cayenne pepper, black pepper, parsley, and salt. Drain the okra and toss in cornmeal mixture. Heat half an inch of oil, about 2 cups, in cast iron skillet over medium heat. Test to see if oil is ready by putting in one piece of okra and see if it sizzles - It should be a slow sizzle, but not too slow. I don't use a thermometer but if you do, it should be about 350 to 375 degrees. Fry okra until golden brown, turning halfway through if needed, about 3 minutes. 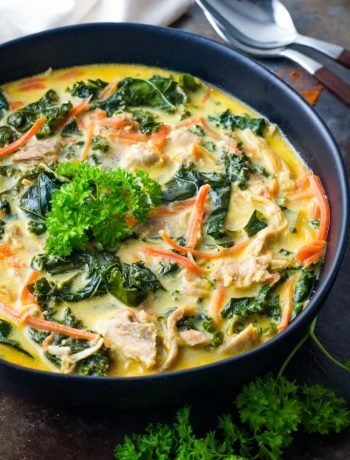 Do two or three batches as needed to not crowd the pan. Scoop out with slotted spoon and drain on paper towel. Enjoy! 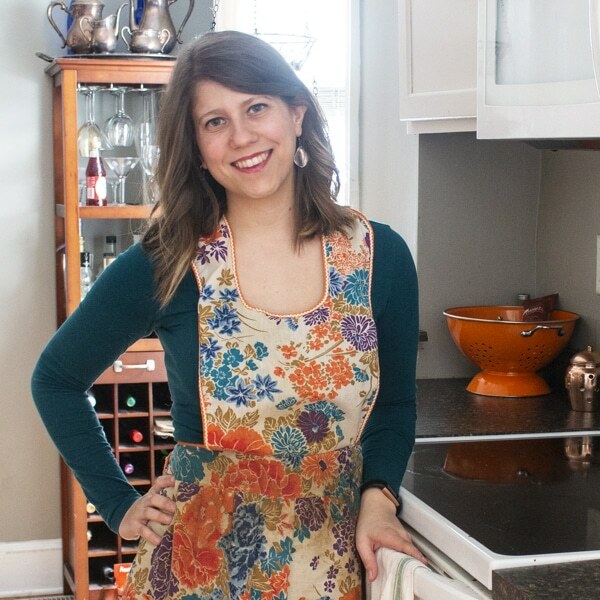 We love okra and made your refrigerator pickles twice last year. 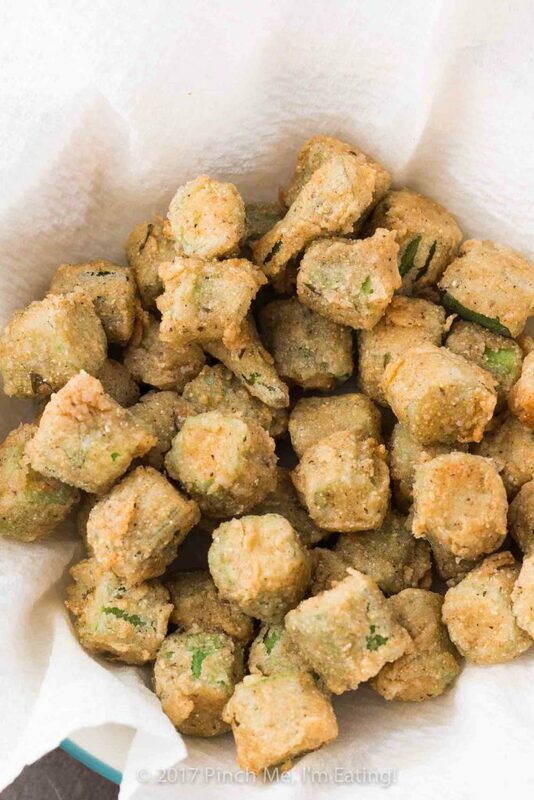 The only fried okra I have had was frozen and disappointing. 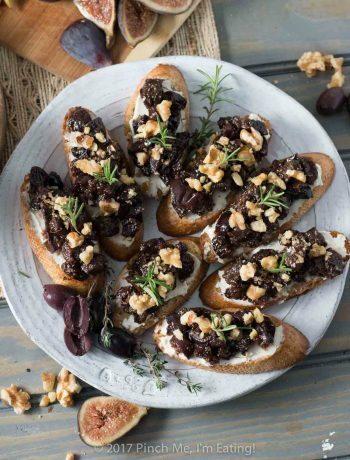 I have some in the fridge now from the market and will be trying my hand at this something this week. … in addition to making more pickles! 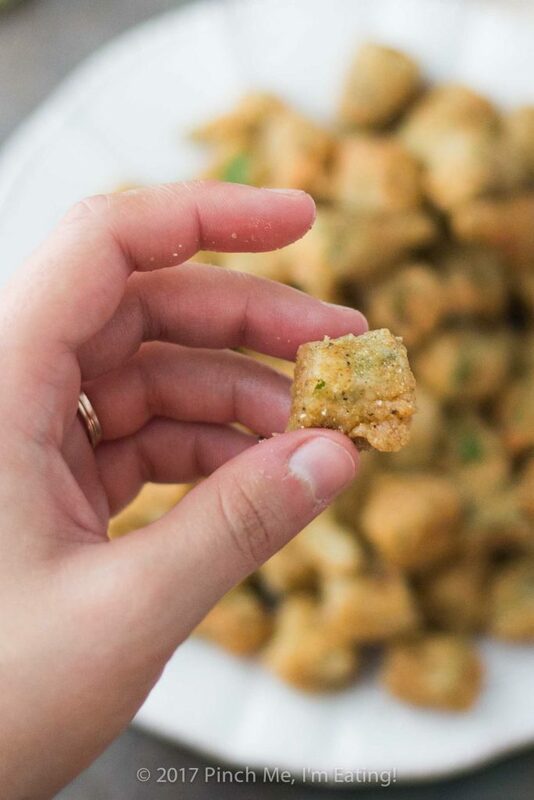 I can’t believe you’ve never had good fried okra! 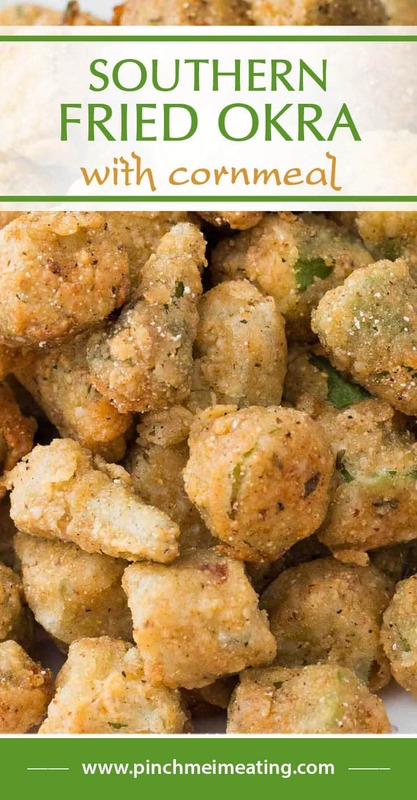 I hope you like this recipe – I may be doing another fried okra variation soon too that’s pan-fried and doesn’t have cornmeal, so it’s a bit lighter. 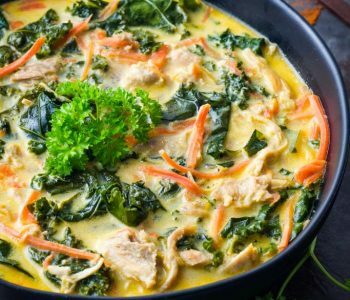 It’s how my stepmom and her mom used to make it. But this recipe is how I usually find it at restaurants or fairs and is what I typically think of as “fried okra”.